PhotoBuddy is the perfect assistant to every professional photographer as well as to serious amateurs. 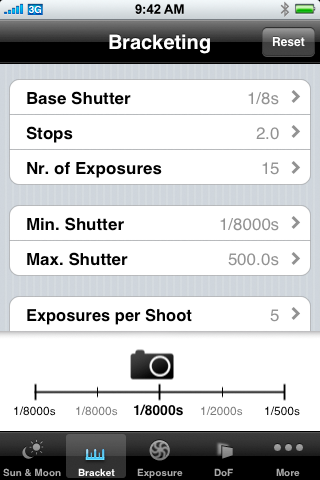 Using PhotoBuddy you can calculate the most needed camera parameters directly on your iPhone or iPod touch. PhotoBuddy was developed for a worldwide release. So you can choose between either metric or imperial units. Compared to other tools for photographers or videographers, PhotoBuddy offers the most complete feature set - for a price you'd never guess. All in one application. You can calculate the Depth of Field (DoF) in an intuitive fashion. PhotoBuddy calculates for the hyperfocal distance, newer and far point as well as the sharp region infront and behind the focused point. The interactive graohic let's you evaluate and compare different settings in a heartbeat. You can even use your fingers to find a crude starting point for your settings. The additional table view allows you to see all settings and results on one page - no need to scroll. PhotoBuddy is the perfect tool for you if you plan to print your photographs in unusual formats (like big prints for close viewing distances). You can customize the parameters that help calculating the Depth of Field to match the size of the region recognized a sharp for the desired viewing distance and print resolution. You are not satisfied with the dynamic range of your camera? Using PhotoBuddy you can find the perfect settings for multi exposure shots with your camera to obtain HDR images. You can specifiy the number of shots you camera can do in auto bracketing mode (AEB) how many differently exposed images you want to take and how many stops your exposures should differ. As a result, PhotoBuddy wil generate a list of all exposures it would suggest and display which exposures you have to set on you camera. Using Applications like PhotoShop or PhotoMatix you can compose images with an extremely wide dynamic range. You often need to determine the Angle of View (AoV)? PhotoBuddy contains an easy to use module to do just that. 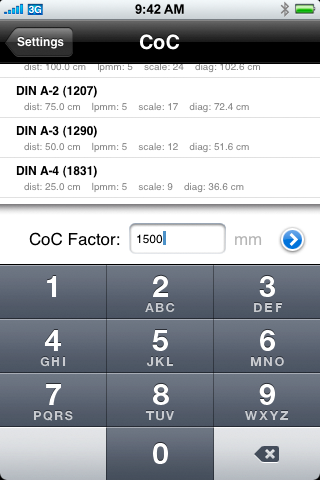 Simply enter the desired focal length you want to use and the calculator will display the angle of view. You can of course to it the other way round too. Enter the angles you are aiming for and PhotoBuddy will give you the focal length you need to use. As with all the other calculators, the flash module allows you to get the most common settings for your external flash device. ...and the shutter time get's bigger than the one supported by your camera simply switch your camera to bulb mode and lett PhotoBuddy's Bulb-Timer do the counting. You don't need to stare at your device while the timer is running. An acoustic signal will start to play when time is running out. Using the "Exposure Dial" you can easily change the parameters (like iso, shutter or f-stop) for any given exposure - without changing the exposure value. PhotoBuddy ships with a set of presets for the most common light situation. You can also use the presets to calculate iso, shutter and f-stop for any given exposure value (for example if your exposure meter returns just the exposure value). 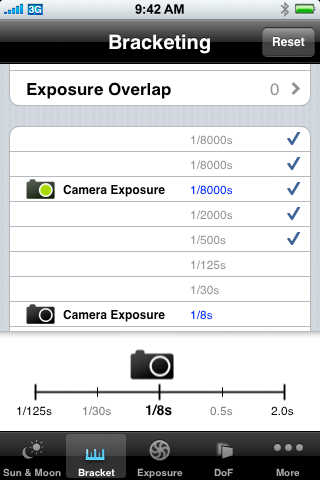 If you are looking for an exposure meter for you iPhone? 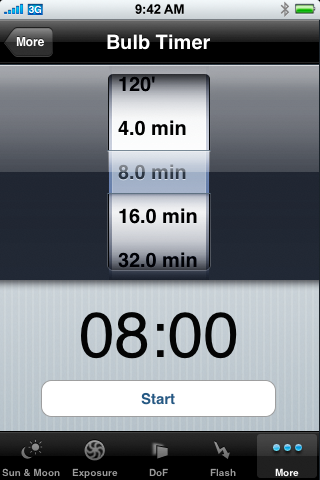 Have a look at LightMeter - the first light meter in the entire AppStore. When using a Filter with your camera you can use PhotoBuddy to adjust a set exposure to compensate for it's darkening effect. 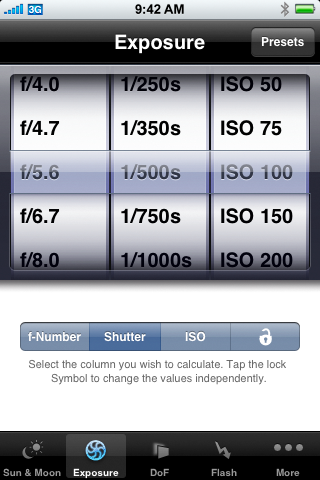 All You have to do is entering the filter factor or stop number of the filter, and PhotoBuddy applies the changes to the exposure set on the "Exposure Dial". PhotoBuddy works out of the box for most DSLr. The Database contains more than 150 models. If yours is not available, you can always create a custom camera setting. 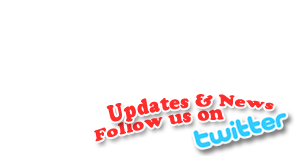 It would be great if you'd also contact us through our support page. That way we can extend the database for you and other users. 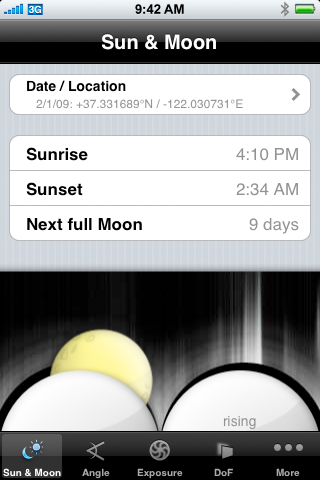 PhotoBuddy displays the moon phase as well as times for sunrise and sunset. And it does for every location. On an iPhone you can automatically determine your current position through the built in location service. You will never be too late for that gorgeous sunset. 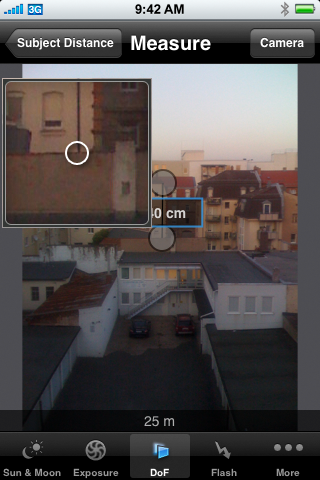 Using the built in camera of an iPhone 2G you can measure the distance to any object of given size. This feature will be available on an iPhone 3G-S as well. 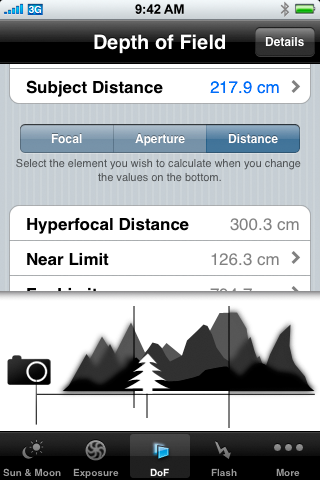 A built in calculator will tell for any given object size and focal length how far away you need to place your camera. That way you'll never cut of the top a building. PhotoBuddy is the only comprehensive Photocalculator in the AppStore to offer bellows/extender correction for macro photography. Using it you can adjust any exposure you set on the "Exposure Dial" for the extension of the bellows and the focal length used. The interface of PhotoBuddy can be configured to your needs. You can put the modules you need most into the tab bar at the bottom of the screen for quick access. Apple, the Apple logo, iPod, iPad, and iTunes are trademarks of Apple Inc., registered in the U.S. and other countries.